What are the most important components of a prenatal vitamin and what should you look for when choosing one? One of the most important vitamins necessary for healthy fetal development is folic acid. Folic acid is a type of B vitamin. It plays an important role in the production of the genetic material, DNA, and helps to support normal cell and tissue function. It’s not surprising that this vitamin is important for development of an unborn baby. Deficiency of folic acid during pregnancy can result in a serious nervous system defect known as spina bifida. This is a condition where the spine doesn’t close completely, allowing portions of the nervous system tissue to be exposed to the outside. The result is partial paralysis, difficulty controlling urine flow, and mental retardation. Supplementing with 400 micrograms of folic acid each day can significantly reduce the risk of spina bifida occurring in an unborn baby. It’s important that supplementation with folic acid be started as early in pregnancy as possible since critical early precursors of the brain and spinal cord are formed in the first few weeks of pregnancy. Although 400 micrograms is the minimum suggested amount of folic acid needed on a daily basis during pregnancy, many prenatal vitamins contain twice this amount or more due to the importance this vitamin plays in development. This is one of the most important vitamins needed for a healthy pregnancy. Folic acid isn’t the only nutrient that plays an important role in pregnancy. Calcium is another key player. A good prenatal vitamin should contain between 200 and 300 milligrams of calcium in the form of calcium carbonate which is the easiest type of calcium to digest. Calcium is needed by the unborn baby to build strong bones as well as a healthy heart and nervous system. If enough calcium isn’t provided to the baby during pregnancy, the calcium can be taken from the mother’s bones which can decrease maternal bone density. Even if you take a prenatal vitamin, you’ll also need to get additional calcium through your diet since most women require around 1100 milligrams of calcium per day during pregnancy. Another critical supplement needed during pregnancy is iron. Iron is important for forming hemoglobin for both mother and baby and most women are unable to get a sufficient quantity of this mineral from their diet. Up to one in five women develops iron deficiency anemia during pregnancy. This occurs because the volume of the mother’s blood expands during pregnancy which creates an increased requirement for more hemoglobin which is only possible when there’s sufficient iron in the diet. A good prenatal vitamin should have around 30 milligrams of iron. These are the most critical vitamins and minerals needed during pregnancy although a good prenatal vitamin will usually contain various B vitamins other than folic acid, as well as vitamins A, C, D, and E along with the mineral zinc. It’s important that vitamin A intake be limited to less than 5,000 I.U. per day due to the potential for toxicity and liver damage. More studies are emerging showing the important role vitamin D plays in pregnancy. Deficiency of vitamin D has been shown to increase the risk of a maternal condition known as preeclampsia. A good prenatal vitamin should have 400 I.U. of vitamin D which should be supplemented with at least ten minutes of sun exposure on a daily basis. 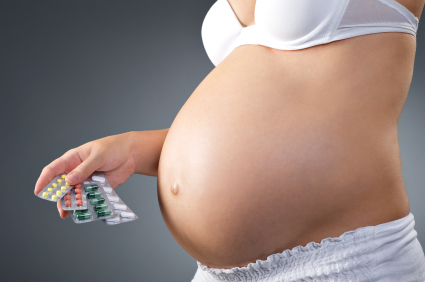 It’s important to keep in mind that prenatal vitamins aren’t a substitute for a balanced diet. Even a prenatal vitamin can’t provide the vitamins and minerals needed in sufficient quantity for a healthy pregnancy. With prenatal vitamins and a good diet, you’ll be well on your way to a happy and healthy pregnancy.